At the weekend, a new Obi of Ubulu-Uku ascended the exulted throne of his fathers. 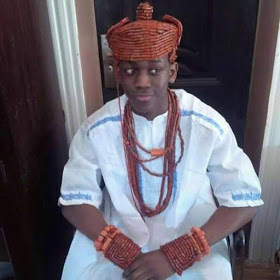 The new monarch, Chukwuka NoahOfulue, who assumed the name of Obi Akaeze1, is actually a youth who will become 18 years old later this year and he had to take time off his schooling in Britain, to undergo the coronation ceremonies because the Ubulu-Uku monarchy succession line is from a father to his first son. Thus last Thursday night, according to a press statement signed by Mr. Tony Eluemunor, Chairman of the Coronation Public Affairs Committee, a great wave of joy surged through the entire Ubulu kingdom, and messages swirled across the internet cyber space as Ubulu-Uku sons and daughters exchanged messages about the joyous development in the town. The statement read: “In a sense, the deep mourning which had enveloped the Ubulu kingdom almost all January this year as their immediate past king, Obi Edward AkaezeOfulue 111 was kidnapped early in the month and was found dead 18 days after, had continued till the ascendance of the new Obi. Anywhere one or two Ubulu-Uku indigenes were gathered, their topic of discussion was invariably the great loss they had suffered through thedeath of the gentle, remarkably patient and immensely religious late Obi. This pall of mourning had also affected all those who were late Obi AkaezeOfulue 111’s schoolmates at St. Anthony’s College Ubulu-Uku in the mid-1970s as the handsome and ever smiling Akaeze was full of zest as a student. There, he was also a good mixer despite his privileged background and readily shared his provisions and money with the less privileged students. He firsts attended the Ambrose Alli University Ekpoma, and left there for London where he was born in the 1960s, and became a lawyer. He also was not just a noted Christian but he actually was a Deeper Life Pastor. His Christianity informed his life as a king for the nine years he was on the throne. Eluemunor said: “The gentle late Obi Edward AkaezeOfulue 111 was laid to rest in the special cemetery that is exclusive to Ubulu-Uku kings on Friday. That was a day after his son had assumed his rightful position on late his father’s throne. In the presence of Umu Obi (members of the Ubulu-Uku Royal family up to the fourth generation) and the influential UmuOxim people (descendants of past kings of the town from the fifth generation onwards) and the respected Council of Chiefs, the new Obi was crowned late Thursday. Immediately, knees began to genuflect and heads bowed as people began to pay him homage. As the popular saying goes, the kingis dead; long live the king came true in the town that day. Yes, even as the memory of the late king will linger, even as his former subjects will miss him and pine for him, rejoicing has come into Ubulu kingdom, no matter how haltingly, as the youthful lad, Chukwuka Noah Ofulue, became the Obi Abgogidi, the Obi Agu (the lion), the Obi Akaeze 1 of Ubulu Kingdom. Though just a youth, he has assumed his position in the great circle of life. Prominent Ubulu-Uku citizens including the Aniocha/Oshimili constituency representative at the Federal House of Representatives, Hon (Mrs).OnyemaechiMrakpor the chairman of Anio­cha South council, Mr. Isaac Anwuziaand other high government officials were in attendance. President-General of Ubulu-Uku Development Union, Comrade Jones Ofunne, religious leaders, women, youths and other stakeholders in the community witnessed the coronation. The Palace Secretary, Barr. Joseph Obazei described the coronation as ‘wonderful . This is a young man who was not even looking up to this position because his father was young and vibrant”’.